However, the weight of the rural population, peasant, indigenous and African descent in South America remains important and this is reflected in the different forms of collective ownership recognized in South American countries: Community, associative, cooperative, communal, collective, etc., that have a direct correlation with a diversity in forms of collective access to land in the region: communal endowment, human settlements, titling territories, consolidation and restoration of ancestral lands, land redistribution, etc. ; and the same is true when considering the various forms of collective ownership: rural communities; “cabildos”, territories and indigenous reservations; “palenques” and “quilombolas” territories; communal grazings, to mention only a few. Currently, a recent study on this topic worldwide shows that in 9 of the 12 countries of South America (92.9% of the total regional surface), at least 20% of the land is legally in indigenous and peasant hands under collective systems –bigger than the global percentage- and it is known that in practice, areas with customary rights for indigenous peoples and local communities can be quite higher than that 20%. In the past 15 years, several countries in the region, together with near government social movements, have managed to change their Constitutions to incorporate broader elements related with regulation and guarantees for the full right to land and its distribution; but during the 90s, most South American countries reformed their agrarian laws from a supporter market approach that contrasts with the constitutional measures mentioned. This has determined that, despite the importance of collective land for the south American peasants, Afro-descendants and indigenous peoples, in the current agricultural policies of our countries, progress in its recognition have not been the ones expected, putting at risk the possibilities of maintaining equitable and dignified tenure systems, interesting achieve levels of economic and social development, including progress in terms of respect for human rights and nature itself. Legal content in each country come from a combination of different legal traditions, different historical moments and various political and economic agendas, which in practice has meant that, in some cases, the recognized collective rights are in open confrontation with other rules that favor private property and land market. This contradiction is now reflected in the existence of a dual system of land tenure, where on one hand you have peasant and indigenous communities, with their forms of ownership and traditional production; and on the other hand, you have medium and large agribusinesses, linked to processes of concentration of land and capital, with a production model aimed at export, under the hand of monoculture, use of agrochemicals and genetically modified seeds. Under this dual system of ownership and production, indigenous peoples and peasant communities are losing ground, literally and figuratively. Beyond traditions and culture, which are the current arguments to defend and strengthen collective land ownership systems? Is it possible to speak of a scenario that combines individual rights and collective land rights? How are the rights of women and young people faced in collective tenure systems? 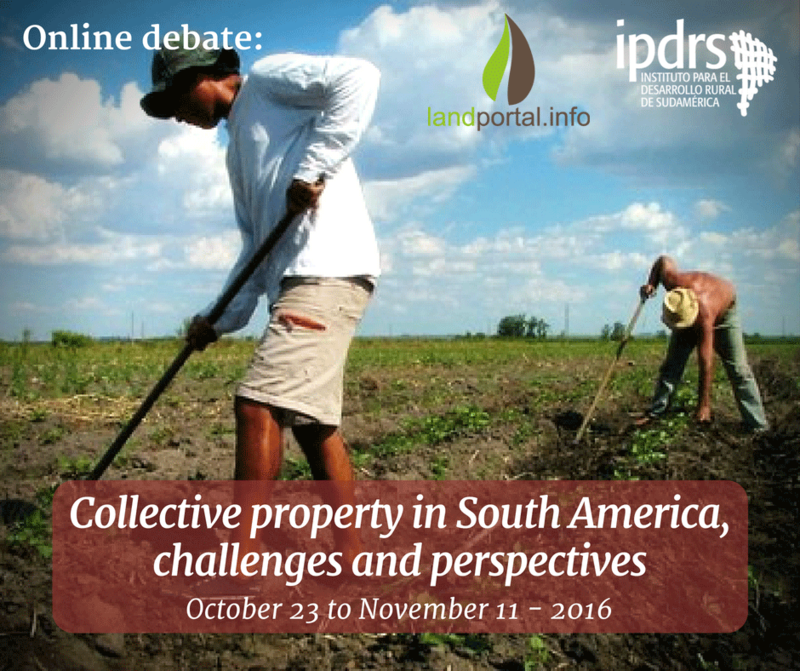 What strategies can or should be taken to defend, strengthen and promote the collective rights over land ownership? What scenarios are emerging for the future of communities with common ownership, in order to fulfill the Sustainable Development Goals? Studies show that norms that govern the internal management of common land and shared resources are defined by subsistence use, sustainability, cooperation, and higher levels of equity than those that undergird a private property system. This automatically pits the logic of land commons against land meant for commercial investments, whose main focus is on profit-maximization. Government laws often reflect this difference in logic. For example in Bolivia, under the 1996 Ley del Servicio Nacional de Reforma Agraria (or “Ley INRA”), indigenous land is not taxed, but also cannot be divided, sold, or mortgaged. In the past, the different logics of land use have not caused significant threats to the lives and livelihoods of communities reliant on land commons. In the present day, these two different logics of land use interact with a host of factors make it harder for local populations to meet their substantive needs: a) increasing population density; b) increasing demand on land globally for large investments; c) increasing climate change pressures. This contradiction-- statutory recognition of indigenous or ancestral land commons, but insecure livelihoods and food security—can be seen in many places around the world. In response, some governments and development programs have introduced interventions to support food production, including improved cultivation techniques, fertilizers and diversification to cash crops. But another solution could be in supporting communities to exploit more economic opportunities, either with outside investors or in partnership with public funds from the government or development donors, while retaining their traits of cooperation and equity. Are there any good examples of this in Latin America or globally? What are the risks for pursuing such a path? We just finished the first week of the debate.The arguments posted to address the defense of collective land ownership are very interesting. From those which collect their need as a political instrument to assert territorial rights, to those that stablish the importance of collective ownership elements in terms of social coexistence and development for the future There were also some ideas raising the importance of the collective dimension of land for the survival of life as we know it, thus raising the need for a "multidimensional strategy with several fronts and actors to form a critical mass"" essential for the defense of collective rights. The debate is interesting and motivating. We have concluded the first week with important contributions and now we begin the second week, asking if it is possible to speak of scenarios that combine collective rights and indiviuals land rights. We will initiate the dialogue also with the ideas of Sergio Coronado and Alejandro Diez. Stay tuned and participate. The majority of te discussion is held in spanish, but nevertheless, you can also make your comments in english. Another week just passed and the ideas presented in the debate were very interesting. Here you can finde the most relevant. There is no pure notion of collective right to land, since it always occurs with certain degrees of individual or family rights; and this combination is a condition for the exercise of the same collective right itself. This need for both forms depends on the conditions of production, on the nature of natural resources and on the social forms of organization of work and consumption, explaining an inevitable tension between production and consumption, more associated with the familiar notion, versus the collective notion understood as a defense against threats. However, this tension is manifested in varying degrees that can be considered as determined by the levels of restriction imposed on the land market within the collective property. We must understand that individual and collective rights to land complement each other. At the individual level with regard to the legal security of access and use of land, and at the collective level with protection against concentration and land grabbing. The property is expressed through three faculties: that of using, that of enjoying and disposing. The first two are easily recognized from the collective to the individual in a complementary way. As for the third, this is where the community intervenes, regulating, not prohibiting, the market within the community. When the system of regulation is well built, there are no problems and there is a clear complementarity. Now, in this perspective, what happens to the individual rights of women and young people? Traditionally women's rights have been denied, unknown or at least marginalized from collectivities; however, these trends are currently changing due to initiatives such as land registration or the processes of political and economic empowerment of women in collective rural settings. Thus, women's access to land depends on their status and position in organizations that have collective lands, so their political rights and their ability to exercise them are fundamental to access to land as well. As for young people, the situation is similar, except for the generational conditioning linked to the shortage or not of available land for new generations, so it is necessary to consider the issue not as a theme of access to new lands, but as a need for generational and technological replacement in the way of managing the land and production in the rural area. We are grateful for the inspired contributions of Alejandro Diez and Sergio Coronado during these two weeks, and now we invite Gonzalo Colque to open the third and last week with some questions regarding territories and collective properties and their relationship with production, market and development. We also invite all of you to participate in the las week of the debate. The dynamics of the latest contributions have been marked by a reflection on whether communities and territories should be integrated into the markets of both inputs and production that is generated in the territories and if this inescapable mercantile link must be considered in other terms or from other perspectives more appropriate or adecuated to the life practices of indigenous communities. Likewise, some ideas have also been raised on how land markets are dealt with internally, in territories and collective lands, where the role of organizations and their rules is fundamental. On the other hand, the development of the debate has also been determined by specific elements about the context of the titling process of collective lands and territories in Bolivia, the complex reality that these spaces run trough from the perspective of the indigenous territorial management and its struggles for the recognition of rights linked to self-determination, self-government and indigenous autonomy. We hope that the contributions and the debate will continue.